BAGHDAD - Saddam Hussein was buried before dawn on Sunday in his native village of Awja, near Tikrit in northern Iraq, the head of his tribe and a family source said. Ali al-Nida, head of the Albu Nasir tribe, said the burial in a family plot took place in the early morning, less than 24 hours after the former president was hanged for crimes against humanity. He gave no further details. A source close to Saddam's family confirmed his remains were interred at Awja, where his sons Uday and Qusay, killed by US troops in 2003, also lie in a family plot. The family had said he might be buried in the western city of Ramadi. 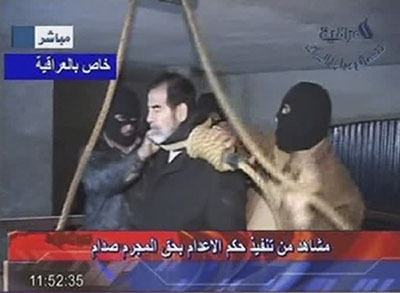 Arab television stations broadcast new video images of Saddam's hanging, apparently shot on a low-quality camera by guards or other officials at the execution, taken from a different angle from footage shown on Iraqi state television. Al Jazeera froze a frame of Saddam with the noose around his neck before the trap opens but continued playing an audio track that stops abruptly after Saddam began the second verse of the Muslim profession of faith: "I bear witness that Mohammad..."
There is a mechanical sound like that of a trap opening. The new video also bore out witness comments on Saturday that the 69-year-old former strongman, who looked calm and composed as he stood on the gallows, had shouted angry political slogans while masked guards were bringing him into the execution chamber once used by his own feared intelligence services. Grainy video also later showed his body in a white shroud, the neck twisted and blood on a cheek. Tribal elders in Tikrit, on the Tigris river 175 km (110 miles) north of Baghdad, took delivery of the body on Saturday, an Iraqi government source confirmed. A lawyer for Saddam said it was sent there aboard a US military aircraft. Details of the burial were scant and tribesmen kept onlookers away from Awja as day broke, a local journalist said. Awja is small settlement of unusually grand homes, signs of the prosperity it enjoyed during the rule of its most famous son, born there in poverty in 1937. It appeared Saddam would lie close to his sons, whom he groomed as successors. During three decades of harsh rule, clan members from around Tikrit in particular, and minority Sunni Muslim Arabs in general, played a dominating role at the expense of ethnic Kurds and of the Shi'ite majority that has taken control of government following the US invasion that overthrew Saddam. While government officials had indicated he might lie in a secret, unmarked grave for fear the site could become a shrine and focal point for Baathist rebels, it appears they have taken the view that Uday and Qusay were buried there three years ago and the cemetery can be kept under surveillance. Three decades after Saddam established his personal rule by force, his death closes a chapter in Iraq's history marked by war with Iran and a 1990 invasion of Kuwait that turned him from ally to enemy of the United States and impoverished his oil-rich nation. However, as US President George W. Bush said in a statement, sectarian violence pushing Iraq towards civil war had not ended. Car bombs set off by suspected Sunni insurgents killed more than 70 people in Baghdad and near the Shi'ite holy city of Najaf. Prime Minister Nuri al-Maliki, his fragile authority among fellow Shi'ites significantly enhanced after he forced through Saddam's execution over hesitation from Sunni and Kurdish members of his government, reached out to Sunni rebels. "Saddam's execution puts an end to all the pathetic gambles on a return to dictatorship," he said in a statement as state television showed film of him signing the death warrant in red ink. "I urge ... followers of the ousted regime to reconsider their stance as the door is still open to anyone who has no innocent blood on his hands to help in rebuilding ... Iraq." "Bringing Saddam Hussein to justice will not end the violence in Iraq, but it is an important milestone on Iraq's course to becoming a democracy that can govern, sustain, and defend itself," said Bush, who has defended the 2003 invasion despite US troops' failure to find alleged banned weapons. The US death toll in Iraq is just two short of the emotive 3,000 mark and December is already the deadliest month for the Americans for more than two years. Bush has promised to unveil a new strategy in the new year. The United Nations, the Vatican and Washington's European allies all condemned Saddam's execution on moral grounds.